Globally, the Camry has been an outright success and has sold more in numbers than most other cars you can think of. In India, though, it hasn’t set the sales charts on fire. 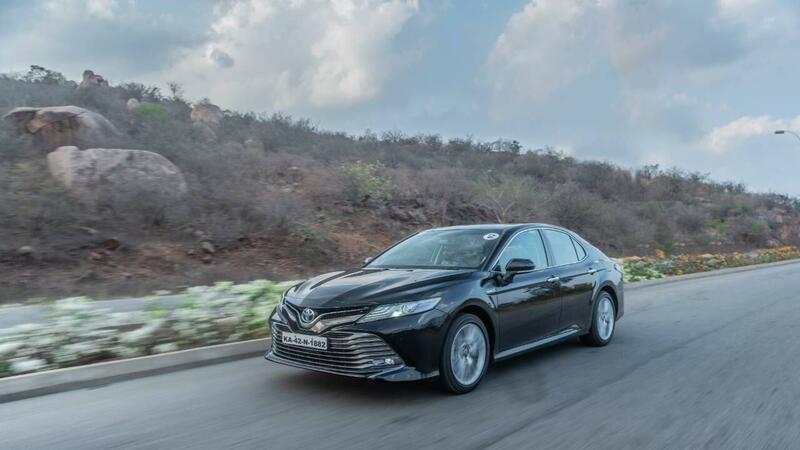 In the three generations sold in India, Toyota has managed to find only 11,425 homes for brand Camry. Now, in 2019, with the competition stepping up its game to a great extent, Toyota, too, has rethought almost the entire car – including the drivetrain, platform and the design. This Camry is based on the Toyota New Global Architecture that focuses on increasing torsional rigidity and uses materials that are both strong and light at the same time. The Camry, even in its previous form, was a fairly large sedan, and this time, it has grown to free up even more space in the cabin. It is 35mm longer and 15mm wider than the car it replaces and despite the larger dimensions, the increase in weight is nominal. The engineers at Toyota have pulled the wheels as far as they could to increase the usable space in the cabin. To put it in numbers, the wheelbase has gone up by 50mm. The design of this new Camry is striking. With the distinctive face and sharp creases, it certainly stands out in a crowd and calls for your attention. It has even been made shorter in height to make it look a bit sportier. For most, the most appealing angle of the Camry would be from dead front. The horizontal slats on the lower grille do the trick in getting your attention. The headlamps with its L-shaped DRLs complement that and the sharp creases that run the length of the car make the Camry striking. Probably, the only area where the designers seem to have lost interest is at the tail-lamps – they look too similar to the Toyotas of yore. On the inside, too, things have changed for the better. This one looks like there’s a hefty dose of modern design put in. There’s an asymmetric design to the dash that looks cool and is ergonomic at the same time. Loads of buttons that do loads of things surround a large touchscreen that sorts you out with navigation and entertainment. among other features. The instrument cluster is also a piece of art with large dials on either end and a big screen at the centre to throw information about the car at you. While the dashboard design and fit-finish of the Camry are almost flawless, the highlight of the cabin has to be the rear seat. There’s acres of space to stretch your legs and the seat is comfortable enough to put you to sleep. It reclines to a good angle. The lads at Toyota have put in controls for the rear sun blind, climate control and a few more things on the rear centre armrest just so that you don’t have to move more than three muscles to set up the Camry to your liking. Nice touch, there. Just like the last gen, the Camry’s 2.5-litre petrol engine is assisted by an electric motor to offer adequate rush and a fuel efficiency figure of a small diesel hatchback. This one uses Nickel-metal hydride batteries that sit below the rear seat to power the electric motor. The electric motor, just by itself makes 116bhp and 202Nm of torque. And couple that with the 2.5-litre four-pot petrol mill that churns out 174bhp and 221Nm of torque, and you’ve got sufficient power to get you going quick. Of course, the setup isn’t sporty by any standard. The engine is mated to a CVT that leans towards saving fuel rather than setting a record at the drag strip. It’s all easy and smooth. Refinement, though, is great. The Camry has never been the choice for someone looking for a car with sporty character, and this one continues that legacy. The Camry has always been a car you choose with your brain rather than the heart. But at the same time, this generation of the Camry polishes out most of the flaws that its predecessors may have had. Ride, for instance, is supremely supple. The engineers have gone with a double wishbone suspension to knock off all road undulations from reach your back. It’s got large 18-inch wheels that don’t offer much help in making the ride any better, but despite that, the Camry would be ranked quite high in terms of ride quality. This gen gets a new steering column that makes things a bit more direct, but despite that, the feedback and communication to the wheel is bare minimum. But on the brighter side, it feels a bit less vague compared to the last gen unit. With the work that has gone into the making of the new chassis, it is apparent that it is more willing to tackle a road with twisties. It’s got better traction at the front, which reduces the understeer to a fair extent. As a whole, it remains a competent car but not sporty by any standards. Toyota has hit a homerun with the pricing on the latest gen despite not getting any rebate or subsidy for hybrids from the government. This is one of the few times that we get to say this – this one is cheaper by Rs 43,000 from its predecessor. It retails at Rs 36.95 lakh (ex-showroom), which puts it right against the Skoda Superb and VW Passat. Yes, it is slight more expensive than those two, but offers hybrid tech and better fuel economy. It definitely isn’t as sporty or fun-to-drive as the Superb or Passat, but it has one ace up its sleeve that helps it carve out its own niche in the premium sedan game – the hybrid tech and hence its fuel efficiency of 23.4kpl (claimed). The Camry is not just more soothing to the eye inside-out, it is also nicer to the environment and helps you curb your fuel bills to a great extent. If all of that doesn’t interest you, the back seat comfort certainly will. Looks striking and has a luxurious cabin. Hybrid tech brings in best-in-class fuel efficiency. Not the most sporty premium sedan around.